Imaging and process management is a strong focus in today's enterprise. Oracle provides a number of products that provide a solid toolbox for exactly this reason. This article will review a number of products, define some terms, and provide some process flow examples showing how the different products related and couple to each other. Starting with an overview, please keep in mind that there are two similar terms in this world: Oracle WebCenter Imaging (a.k.a., IPM, WebCenter Imaging, Oracle WebCenter Content: Imaging, WCI, etc) and "the image process" or the "imaging solution". Oracle WebCenter Content: Imaging (formerly known as “Oracle Imaging and Process Management” or Oracle IPM) is Oracle Corporation's product that combines document management and business process management suite and is marketed as a component of the Oracle Fusion Middleware portfolio of products. The overall Oracle imaging solution is a combination of multiple technologies like WebCenter Imaging, Capture and Forms Recognition. Overall it provides enterprise-class imaging platform for end-to-end management of document images within transactional business processes. It's a solution that provides comprehensive content management and business process management capabilities - from document capture and recognition, to imaging and workflow - which communicates with Oracle's business applications and built on the Oracle Fusion Middleware infrastructure. WebCenter Imaging: This provides security, annotations, searching, and is the current primary user interface for processing work items in the imaging solution. SOA: This provides business process management capabilities including human tasks, workflow management, service integration, and all other standard SOA features. A number of 'jumpstart' processes are available to help accelerate the integration of business applications, such as an accounts payable invoice processing solution for E-Business Suite applications to facilitate processing large volumes of invoices. Capture: This is known as WebCenter Capture. It expedites the capture process of paper invoice to electronic documents. It facilitates high volume scanning using desktop and web interface. It easily gets gel with various scanners and allows flexible indexing options. Forms Recognition: This is known as WebCenter Forms Recognition. This works on learning-based intelligent document recognition mechanism. This can recognize, categorize and extract information from variety of documents. It uses patterns and not locations, to efficiently locate, extract, and link data. This can also validate the data from database. It minimizes the need for human intervention by automating data extraction. The process initiates from WebCenter Capture (formerly known as ODC). 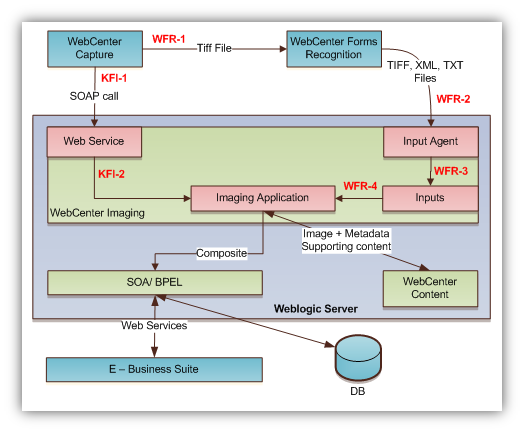 The process can take 2 paths to send the data to WebCenter Imaging (WCI). Each path has its own significance and importance, one is called as KFI (Key from Image) and another one WFR (WebCenter Forms Recognition). Both of these flows involve different approach of pushing the image in WCI and level of detailing in case of data. This approach is used for committing the image directly to WCI server with bare minimum metadata. This is simplest and quickest way to push the image in WCI. As shown in above diagram it takes route of KFI-1 and KFI-2 to reach to WCI. 2. Image is indexed using indexing profile. 3. It is committed using index profile itself. 4. Based on the commit profile it will invoke the WCI’s web service and will pass the metadata and document image over SOAP protocol. This is configured with in commit profile. KFI-2: This depicts the activities which happen within WCI once the web service received the metadata and document image. As these are internally handled, there is not much documentation available on this. This being internal part of WCI, this will not fail. I believe in case of failure we should be able to raise an SR and get the issue resolved. This is automated approach where the data is extracted from image using series of operations like Optical character Recognition (OCR), Classification, Extraction and Export. This creates the 3 files (Tiff, XML and TXT) which are fed to the WCI input agent. The WCI input agent directory is a standard ingestion method for adding content to WebCenter Imaging. These steps are described in detail below. WFR-1: This covers the communication between WCC and WFR. 1. WCC commits the batch using respective commit profile. 2. It creates the TIFF file in the export directory configured in the commit profile. 3. The data is passed using file name of TIFF. Generally file name contains different values in the file name separated by “_” (underscore). Mostly it has values like URN, priority, organization, etc. You can add additional information in file name. However you need to do script changes in WFR to read the data and process it. WFR-2: This covers the communication between WFR and WCI input agent. By this time WFR is done its job and data is extracted. 1. WFR does the processing like OCR, classification, extraction, export and pulls the data from image. It created 3 files in the output directory configured in the WFR export location. 1.1. TIFF: this contains the document image. It may be a multipage. This is the same file that has been given as an input to WFR by WCC. 1.2. XML: this contains the data extracted from the document image. The xml elements are controlled from INI file and scripts in WFR. 1.3. TXT: this contains the metadata that will be filled in WCI application. 2. All these 3 files will be exported in WCI’s Input agent directory. 3. WCI has a listener pointed to this folder which wills pick-up the seeding file defined in mask under inputs entity in WCI. WFR-3: This covers the details which happen once the files are added in Input agent and inputs gets activated. 1. In WCI admin section under “Manage Inputs” we must have defined the masks. These masks are generally pointing to seeding file. In our case it is TXT file. 2. Based on the input mask, Input agent will pick-up only the seeding file (in our case it is TXT). This file will have the metadata which will be mapped with application fields. The XML and TIFF files are referred from seeding file (i.e. TXT). 1. TIFF file is pushed in UCM and the unique WCI URL is created using configuration made in WCI schema. This URL becomes a web viewable URL to show image in AXF paradigm. In this stage Doc ID is created which is used as a unique key for accessing the document. 2. Based on the mapping data will be read from TXT file and new record is created in the WCI application. 3. The XML file is used as a supporting content which is passed while invoking the BPEL instance. This communication is common for KFI and WFR flow both. The imaging application has 2 types of connections, one of them is WebCenter Content server. Below events happen using Content server connection. 1.1. TIFF images along with the metadata which has been received as imaging application fields. While doing this the web URL. This URL is a combination of multiple parameters which are defined in configuration table present in WCI schema. Content server creates an unique Document ID based on the prefix configured and auto-increment number. While creating the web-url, WCI also adds the application ID as the prefix. 1.2. Only in case of WFR flow is invoked, it passes the supporting content which is XML file content. For KFI this will not happen. 2. The document ID generated in Content server is also saved in the Imaging application. This is a unique reference number for the document. This is based on the workflow configuration made in WCI. This integration is the same regardless of KFI or WFR . This works like a trigger, as soon as new entry is made in the imaging application, this is triggered. Below events happens using SOA server connection. 1. Once new entry is made in the imaging application, prior to this data has been already pushed to Content server & related data is also available in the imaging application, this uses the workflow configuration. 1.1. Workflow configuration has details like SOA server connection, composite name, its revision, mapping of the fields. 1.2. Using above details it invokes composite web service exposed by SOA server. 1.3. Using parameter mapping it creates the input SOAP XML. Few important fields like document ID, document URI are also passed. These values are used in future communication. 1.4. This SOAP XML will also have the supporting contents present in XML file sent to imaging in WFR flow. 2. Once the SOA composite is invoked from imaging, there is no further action lined up in imaging. There are no events that happen in imaging which pull or push the data to any other entities. However metadata is updated in imaging application using value of document ID by BPEL. In the WCI environment, the SOA server is used as a process and service integration engine. The process is configured among different composites. The universal entry point is always the first composite invoked from WCI. For the AP Solution, it is Document Routing composite. Based on different conditions respective composites are called. Here we will not discuss each composite in details (that will be covered in later blog). SOA communicates with EBS and pulls/ push the data in its EBS database through a number of service integrations and EBS stored procedures. All these composites are part of the AP Solution Accelerator which comes as a starter kit (not supported by Oracle support) with WCI. This can be acquired by Oracle channel partners only, it is not freely available for download. In case of KFI flow below composites are involved. 1. The first composite in all cases is “Document Routing”. 2. From there it calls “Invoice Processing”. 3. In invoice processing, there are multiple actions which lead to different composites. In KFI this is one of the main controlling composite. Once the instance is complete in this, it will end the instance. 3.1. The simplest will be if user clicks on “Complete Invoice” actions, it would end the instance. However prior to this the check is made if invoice image is attached to EBS invoice or not. This is done based on Invoice_ID value. 3.2. Other common action is “Invoice Approval”, this will invoke Invoice approval composite. This composite is simply processes the outcome and sends back the response to calling composite. 4. In this flow the invoice image from WCI is linked with invoice of EBS manually. The process involves below steps. 4.3. This will open the WCI’s invoice processing task list. 4.5. Looking at the WCI image do the data entry in EBS invoice entry screen and save the invoice in EBS. 4.6. Once it is saved, it will call web service of WCI and send the invoice id from EBS. 4.7. This will get updated in the image open in WCI popup. This way the link will be created. In case of WFR flow below composites are involved. 2. From here it calls “Invoice Import” composite. 3.2. It will check the type of invoice. 3.2.2. If it is non-PO then it will call account distribution and allow user to do the coding. 3.3. Then it will invoke Invoice validation and import composite. This composite will do the detailed validations and will add the invoice data in Open interface table of EBS. Later on from there it will be sent to Invoice master table using concurrent job. This composite will send status of validation back to Invoice Import. 3.4. Based on the validation status it will do further activities. 3.5. The EBS response will be processed in “Post Invoice Import” composite. In this flow most of the time link between Invoice image of WCI and invoice of EBS is made in invoice import itself. In case it fails due to validation or rejection from concurrent job then user has to follow the KFI process to setup the link manually. In this post, the basics of the Oracle imaging solution were defined. We covered the key products as well as some of the options of the AP Solution Accelerator. At this point, you should be able to recognize how Oracle has constructed a product suite which acts as an excellent toolkit for creating any secure, reliable, business process you can conceptualize! Special thanks to Vikrant Korde for authoring this post! Oracle WebCenter Forms Recognition (WFR) 11.1.1.8.0 now available! Oracle released WebCenter Forms Recognition 11.1.1.8! You can get your copy on edelivery. It is under the Oracle Fusion Middleware Product Pack and Windows x86 or x64 platform. Note that it's not under the typical Fusion Middleware Media Pack, but instead OFR has its own Media Pack. You'll find the product download there. I don't see the documentation in the 11.1.1.8 document library, but the .zip download does include the updated docs. You'll also find the updated AP project within the .zip. "AP Packaged Project_1007CA" can be found under the Projects\AP\Global directory. In an effort to help everyone stay current, we're going to post some preferred patches on a regular schedule. This way, you'll have a single place to find all of the updated cumulative patches (MLRs, ARUs, Bundle Patches, etc) for the month. Please be sure to let me know if there's any other patches that should be included on this list. The current format has the support recommended installs in bold & underlined, but there are some other nice-to-know patches included as well. These nice-to-know patches may not be necessary for your particular installation. The formatting may change over time, but hopefully this is helpful! ** As always, please be sure to do your own due diligence before applying any patch. This list is for reference only.